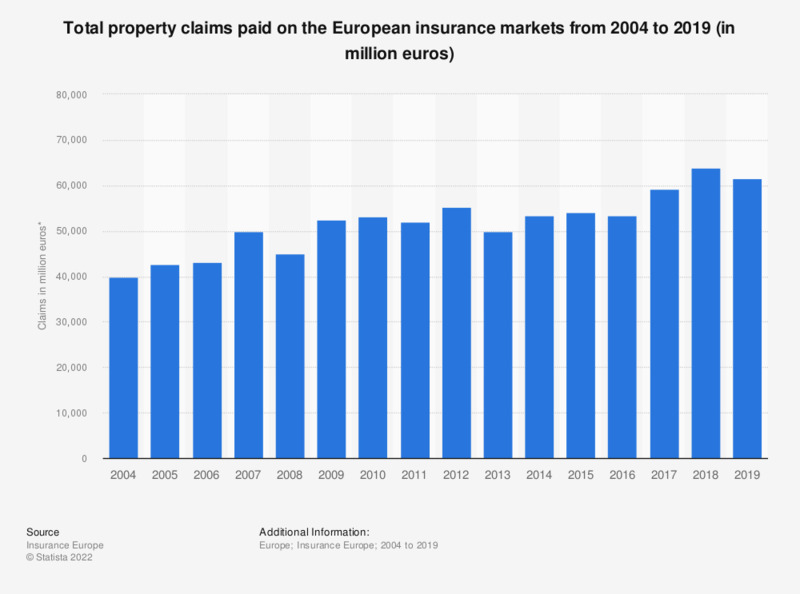 The statistic shows the aggregate value of property claims paid on the insurance markets in Europe form 2004 to 2017. In 2017, the insurance providers operating in European countries paid out approximately 62.7 billion euros in claims on property insurance. The European market includes: Austria, Belgium, Bulgaria, Switzerland, Cyprus, Czech Republic, Germany, Estonia, Spain, Finland, France, United Kingdom, Croatia, Hungary, Iceland, Italy, Latvia, Luxembourg, Malta, Netherlands, Norway, Poland, Portugal, Romania, Sweden, Slovenia, Slovakia, Turkey.